Wharfedale (Yorkshire). 1929. Etching. 6 7/8 x 13 1/4 (sheet 10 1/2 x 17 3/16). A rich impression with plate tone printed on the full sheet of cream wove paper. Exhibited at the First International Exhibition of Etching at the Art Institute of Chicago in 1932. Original exhibition label. Accompanied by the original etching plate. The etching signed, dated and priced $15 (the 1932 price) in pencil. $850 the pair. Wharfedale is one of the Yorkshire Dales' longest and most beautiful dales, and is located in the south of the National Park. Upper Wharfdale’s landscape is dominated by white scars of rocks throughout the valley. Born in Bradford, May Tremel studied at Goldsmiths College, the Royal College of Art and in Frankfurt. She exhibited etchings at the annual Birmingham and Liverpool salons and at the Royal Academy. 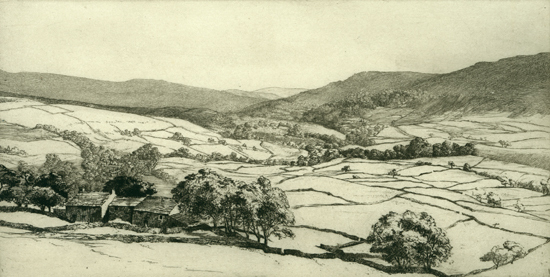 She produced about 60 etchings, primarily landscapes.